Jockey Nick Heywood would love to confirm himself as understudy on Country Championships favourite Don’t Give A Damn by guiding him into the Final at Goulburn on Saturday. The 22-year-old is warming the saddle for Kerrin McEvoy by riding the $1.60 favourite in the $150,000 SERA Country Championships Qualifier (1400m) but still recognises he has a job to do. “He’s got to run one-two to get into the Final but going off what he’s done and the hype around him you’d think he’ll be winning,’’ Heywood said. Heywood said McEvoy will be hearing from him prior to Saturday’s Qualifier to seek out any advice on the Danny Williams-trained four-year-old’s quirks or preferences. He goes to Goulburn every second Tuesday to ride work and jump outs so he’s had one sit on Don’t Give A Damn, at trackwork this week, and while he seems uncomplicated Heywood won’t be taking any chances. “I’ll be having a chat to Kerrin, flick him a message, to see what his opinion is,’’ he said. A minor spanner was thrown in the works when Don’t Give A Damn drew barrier 16, which will likely become 12 after scratchings, but Heywood sees the draw as a plus. Last time the gelding drew ‘poorly’ was in the Anniversary Highway Consolation on Everest Day and he worked across to lead by midrace before clearing out to beat Schedule (who contests the Mudgee Qualifier on Sunday) by 2-1/4 length. When he won first-up at Rosehill on February 3, Don’t Give A Damn did most of his work early on running his first 300m in 19.37 (Punters Intel) and was also quickest in the next 200m running 11.45. 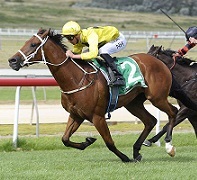 “He’s a nice progressive horse and he gives you that feel he has a motor,’’ Heywood said. The $500,000 Country Championships Final (1400m) is run at Royal Randwick on April 7.